Caption: A Male Monarch Butterfly (Danaus Plexippus) rests on clump of Yellow Yarrow (Achillea 'Moonshine'). 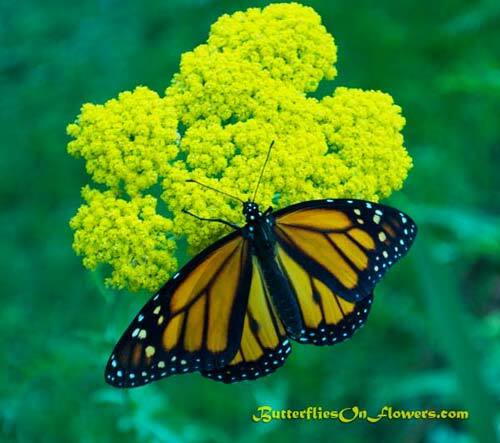 The bright yellow color of this Achillea plant may attract the Monarchs' attention for a fleeting moment but this is not a plant you should add to your garden in hopes of attracting this brilliant butterfly. This monarch was just drying his wings for a short spell before flying off to find something more appealing and ultimately more satisfying. Facts about Butterflies: Research shows that most butterflies are attracted to bright colors. However, new research from the University of Kentucky reveals it's the nectar that keeps them coming back.